The company plans three additional phases at the Hamilton site. When completed the project will comprise approximately 150,000 square feet of fully-automated indoor farming, also known as controlled environment agriculture (CEA). The full-phase expansion will allow 80 Acres Farms to provide more product to serve its existing customers and new ones with just-picked, year-round produce. Produce grown at the Hamilton site will supply Whole Foods Markets, Dorothy Lane Markets, Jungle Jim’s, U.S. Foods, and other retailers and foodservice distributors. 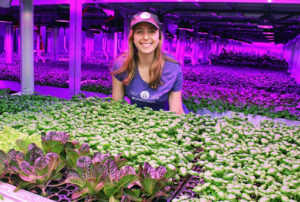 80 Acres Farms currently serves Cincinnati-area customers from its facility in the Cincinnati community where it grows microgreens, culinary herbs, leafy lettuce, kale, vine crops like cherry tomatoes, cucumbers and peppers. Zelkind said the Hamilton site will be automated from seeding to growing to harvesting for highest quality and food safety standards. 80 Acres Farms personnel will manage the Hamilton facility, which will feature robotics, artificial intelligence, data analytics, and around-the-clock monitoring sensors and control systems to optimize every aspect of growing produce indoors.